Home >All Reviews>Tour Buddy>Tour Buddy – Priyantha, the most delightful friendly driver! We travelled as a couple with Priyantha from the airport to Sigiriya – Kandy – Adam’s Peak – Nuwara Eliya – Ella – Mirissa over 9 days. Lots of driving! 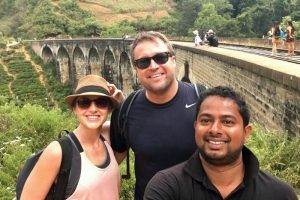 But Pri made the travelling so comfortable and relaxing, that the journey itself became one of the most valuable parts of the whole Sri Lankan experience. He was always ready and waiting for us, answered all our questions intelligently, showed us small details of Sri Lankan life along the way (we stopped to eat cinnamon right off the bark! ), and has a great sense of humour. One of the things we most appreciated was that Pri never pressured us into doing anything, but gently suggested options and recommendations – which, when we did follow them, were always great. He had an excellent sense of our “vibe” (how we wanted to travel, where we preferred to stay and what we preferred to do, etc) and, from seeing his interactions with the people we met along the way, his emotional intelligence extends to everyone, from his good friends at a lovely little restaurant in Ella and at our accommodation in Adam’s Peak to the coconut water seller on the side of 9 Arches Bridge. He knows his country and the people in it like the back of his hand and organised last minute changes and chances for us without any hassle. Gentle, kind, funny and a careful driver. We miss him!